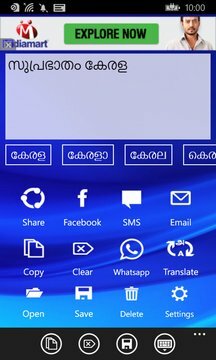 With Type Malayalam application which runs on Windows phone, you can READ/WRITE in Malayalam and share it to the world via Facebook, Twitter, SMS and mail with a click of a button!!! This is a very simple and easy to use app which translates the word you type in English to Malayalam as soon as you press Space or Enter key. Surprise your friends by dropping your favorite line in Malayalam on your Facebook page or tweet on Twitter, type an email, send an sms. 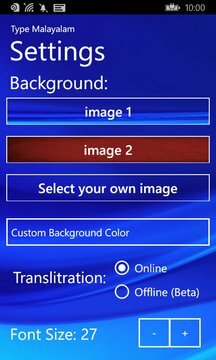 This app works with internet connection and also without internet.